Established in 1983 with a gift from Hugh Cullman '42, the Cullman Scholarship Program supports students in off-campus study opportunities. During the summer of 2018, nine scholarship recipients pursued courses of study ranging from volunteering with Real Cochabamba Soccer Academy in Bolivia to interning with a physician’s assistant in Warsaw, Poland. 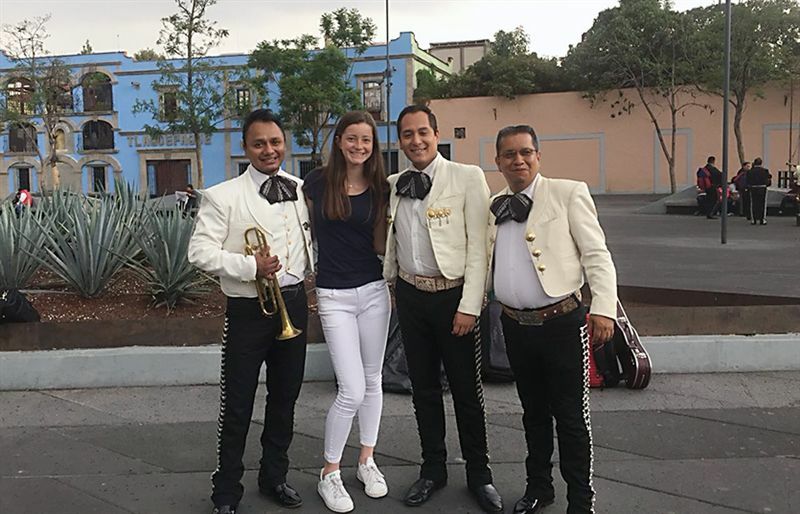 Recently, Emma '20 gave a presentation at All School Meeting about her Spanish language and cultural immersion Cullman Scholarship in Mexico City. This past summer, I participated in a full immersion Spanish language program for international students with the goal of returning with the ability to read, write, and speak fluently. Through academic study and cultural education, this program strives to cultivate appreciation for foreign cultures. I stayed with a host family in Mexico City located near the Frida Kahlo Spanish School. Every day my host mom Adriana took me to the school where I attended a total of six hours of classes per day. Private lessons worked in tandem with the group lessons, as we worked on similar concepts and delved deeper into grammar and conversational skills. I credit my quick improvement to the fact that I did not speak any English throughout the entire trip, forcing me to find the vocabulary to communicate. After school and on weekends, my host family brought me to significant cultural sites and interesting museums including the Pyramids of Teotihuacan, Xochimilco, the Zócalo, the Anthropology Museum, the house of Frida Kahlo, and the National Palace. One of my favorite sites was the Pyramids, where I took a guided tour during the day and attended a light show at night that projected the site’s history onto the Pyramid of the Sun. It was amazing! I was made to feel as if I were an integral part of my host family, as they took me to eat authentic tacos, to movie theaters, and several markets in different zones of the city. Not only was I able to see and hear the Mexican culture and Spanish language, but I was able to live it, which is something I will never forget. Thank you, Emma, for sharing your experience and stay tuned for more Cullman Scholar news.